Writing about and shooting birds does not bore me. Most of the time. But sometimes I need to show something else, just to remain “interesting”. So, instead of simply giving an account of my May Long Weekend, I thought it might be a change to write about a different trip. 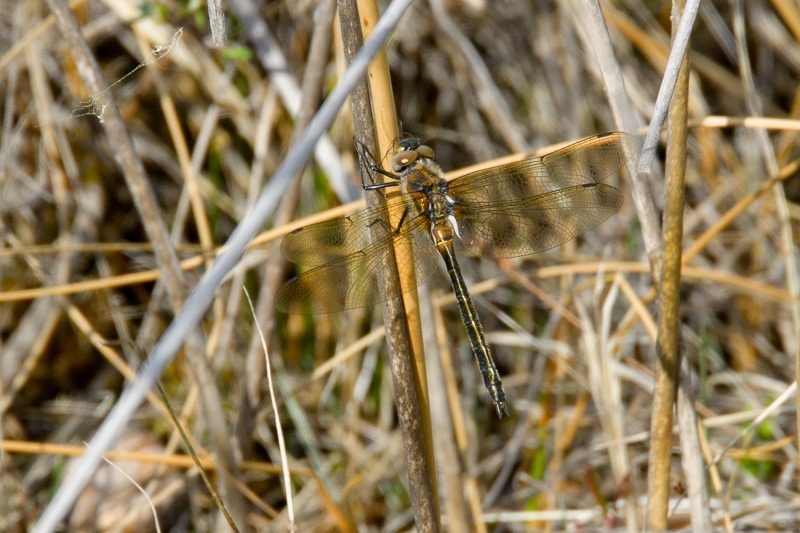 This time it was a trip to the Brokenhead Bog, a little north of Winnipeg. 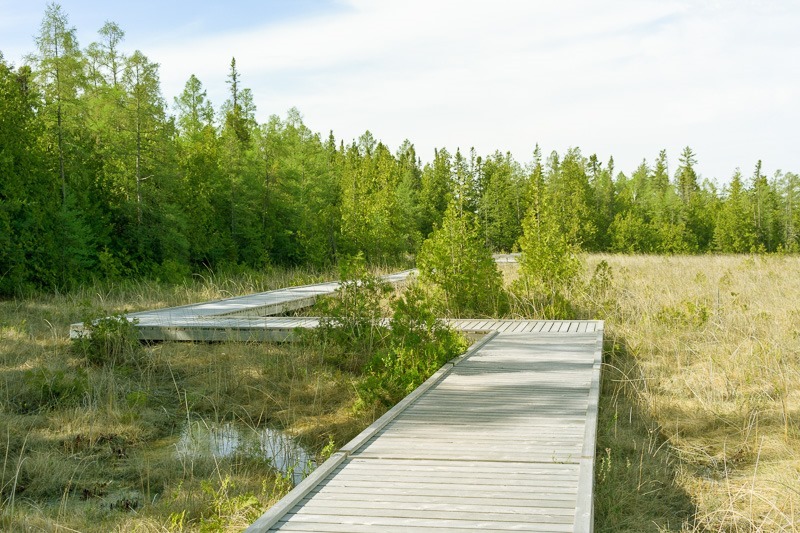 Recently they have constructed a nice boardwalk so you can enjoy the bog/marsh keeping your feet dry. The mosquitoes, however, are an extra you will not be able to live without. I went there with a friend who said he knows a lot about plants and marsh life, so I thought I’d tag along and see what interesting things I could find that for once were not birds. As it turned out, lots of things are interesting there, even if the time was still a bit too early for a blooming bog life. The above Pitcher Plants are carnivorous. I always have the image of a dinosaur in mind when I hear the word “carnivorous”. 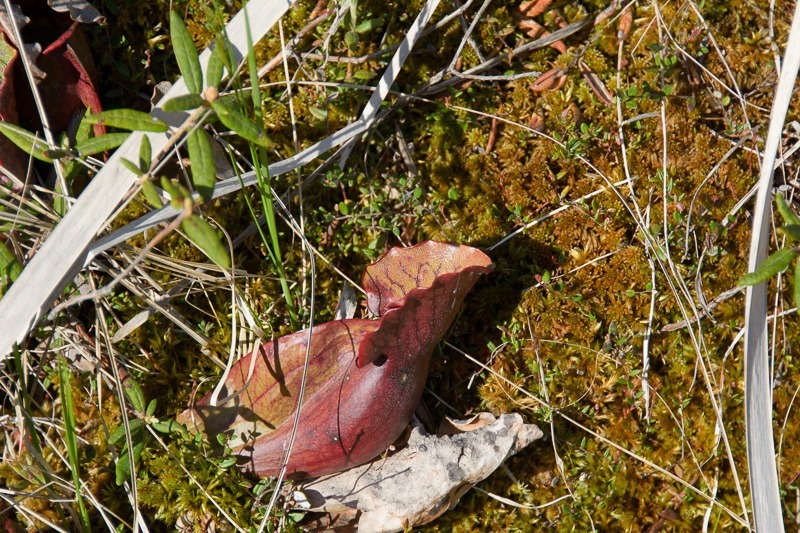 Until of course comes the time for lunch… This Pitcher Plant is also carnivorous, even if it doesn’t actively chomp down on a steak. It simply dissolves insects that have the bad luck to fall for the sweet juices the plant presents at the entrance. After that it’s only going down for the insects. When you say “bog”, you also say water and water life. 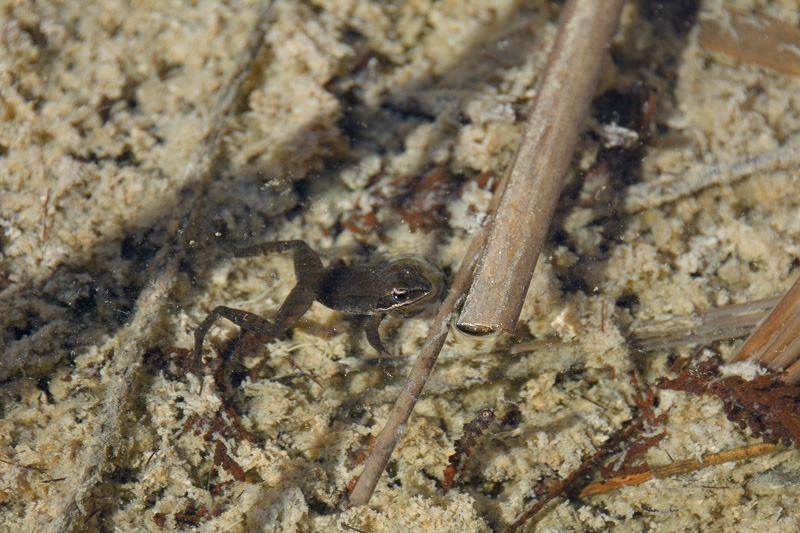 While I didn’t see any fish, the water must be too shallow for that, frogs like the above Wood Frog were abundant. We heard them croaking from far away but when we came closer, they were quiet. Not an easy little creature to spot either. Once it noticed we were looking at it, it decided to hide under some broader leaves. This was the best shot I could get of it. 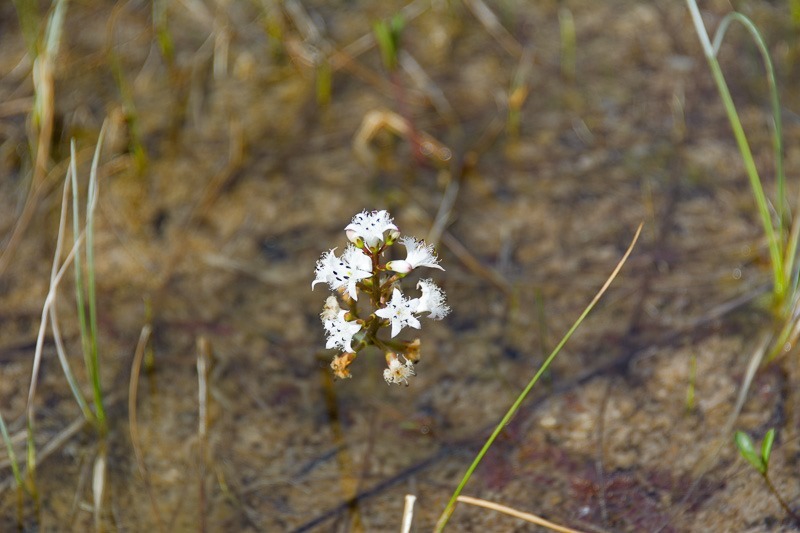 Bogs are full of plant life as well, but my brain seems to be wired to anything but plants and their names. When names like “Buck Bean” pop up to identify the plants and flowers, I all too happily copy and paste them into my Lightroom Catalog, hoping to be able to reuse that later on. By the time we got nicely bumpy from all the mosquito bites, we decided to move on to the Bel Air Forest, not too far away. But the wind was picking up a lot, getting closeup shots of anything proved to be nearly impossible. 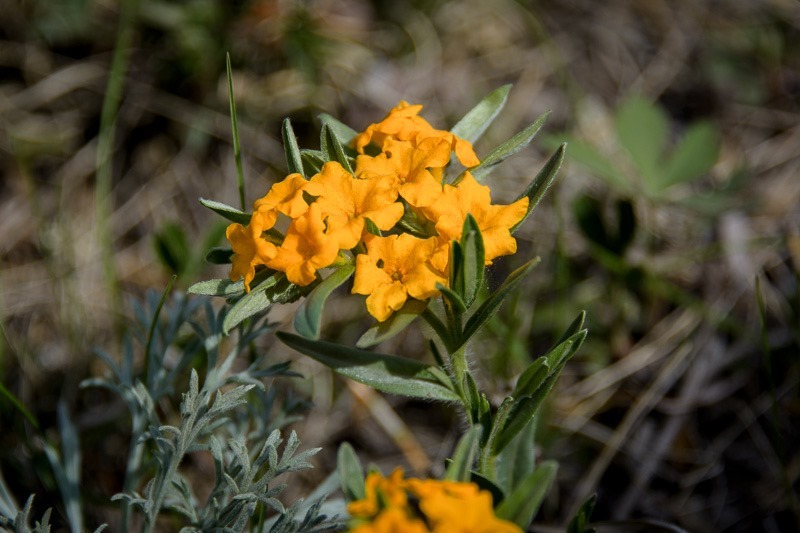 This Hoary Puccoon, however stood still in the wind and gave me a nice picture. The sun came through the leaves of an above tree just at the right moment to light the flowers. After walking around for a while without getting decent pictures, we decided to move on to a place where we could get shots even without good weather. It seemed like these young deer were in total agreement with our departure from their territory. 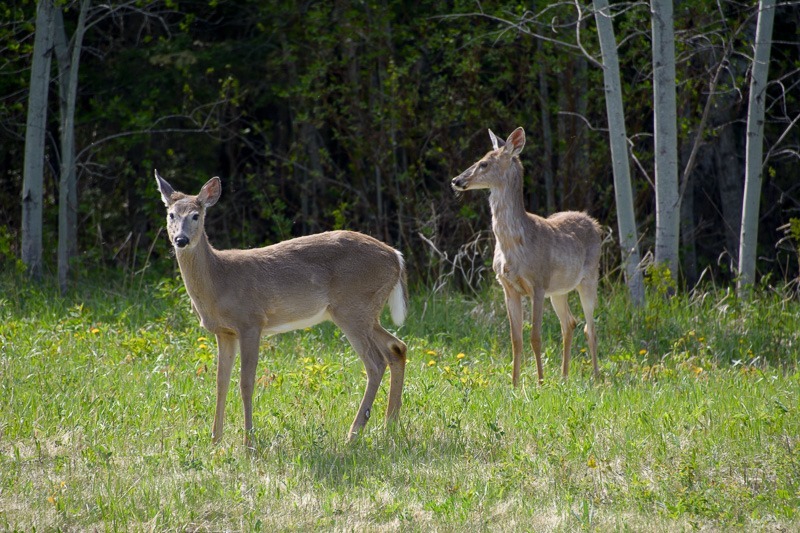 I have shot lots of deer before, but always in a somewhat enclosed environment like Fort Whyte Alive, or even inside the city. These deer were completely free to go where they wanted. It was a nice change to get the really wild deer in my collection. And, as was to be expected from wild deer, they didn’t stay around for a full photo shoot and took off when they saw me creeping out from behind the car . 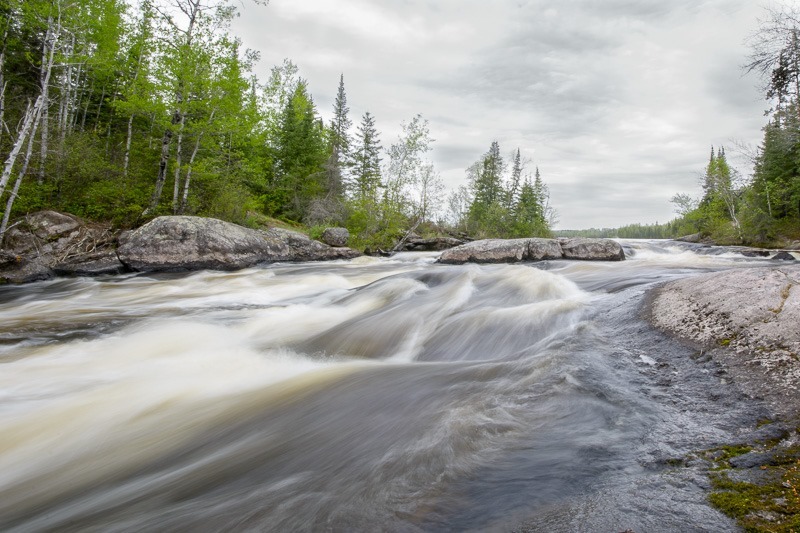 The last stop of the day was at Tulabi Falls, in the Nopiming Provincial Park. This time I came prepared with my tripod. I could finally shoot the falls with that silky smooth water effect of a long shutter speed. Next time, I think that some Neutral Density filters may come in handy to lengthen that time even more. I do like the contrast between the flowing water being smooth and the less flowing water being crisp on the side. No Photoshop involved for this picture, though.